This is just an additional picture of yesterday’s card with some added charcoal pencil detail. 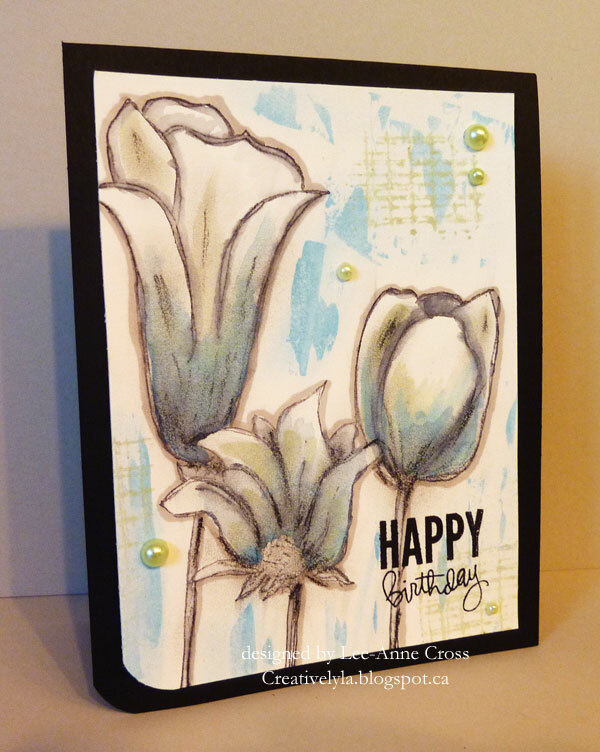 Dina, our Mix-Ability challenge leader suggested I add some pencil to my card. And, with great trepidation, I did…whew…that was a tough thing to do as I haven’t done this before!!! Just thought I’d share the results with you. Thoughts??? This really makes them pop! Love the addition of the charcoal!! I do like the darker lines. Your work is all so awesome. I really enjoyed visiting your gallery. Thank you for taking the time to leave a comment on one of my cards. fantastic card Lee-Anne! Your posies are gorgeous! I agree they do pop!!! Love this, Lee-Anne. I really do like the darker areas to make it stand out. I was reading your post about being away. I've been away for quite a while, too. It's good to be stamping again. I miss seeing your cards! Hope yoou are having a great summer! Hey Lee-Anne, I was just looking back on my sadly neglected blog and came across the Tim tags…didn't we have such fun challenging each other that year (2011). Would you ponder be my tagging partner for this years Tim tags…..